Adorno relies on cliché to describe Rimbaud’s African experience–perhaps he, hermit that he was, had not heard the news of Etiemble’s Le Mythe de Rimbaud. Which myth, in particular, do you think Adorno’s repeating? Is it “employee” that has you bothered, Jonathan? I mean, the guy did write poetry and then quit to go to Africa, no? He wasn’t exactly working at a bank or insurance company, you know. “Stepping into line” doesn’t describe his colonial career terribly well. I’ve not read the Etiemble, but it wasn’t my impression that this was the sort of myth he was invested in debunking. 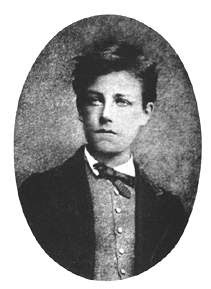 Rather, Rimbaud as perverse prophetical homosexual saint…. Does he really debunk the myth of Rimbaud as sold out Kurtz-in-reverse? He debunks pretty much everything you’ve ever read about Rimbaud (including, proleptically, subsequent English-language criticism), some things more coherently than others (three or four volumes this goes on). There was no sudden renunciation. 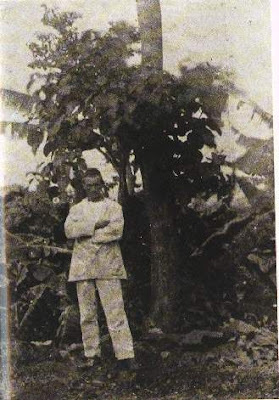 Rimbaud’s African career was extraodinary, by any measure (note the hieratic and menacing pose of the figure on the right), a pathetic actualization of the Saison‘s career plans, though certainly not a conscious one. I’ve read Aesthetic Theory, in what was, in retrospect, an extraordinarily ambitious graduate seminar; and if I could find my copy on the currently disarrayed shelves I’m sure I would see an outraged scribble next to that unfortunately vague recapitulative comparision. The statement you quote in the title has always seemed to me to be more mocking than disposing.